Egyptian pipeline which provides gas to Israel and Jordan once again hit by an explosion, the seventh time since February. 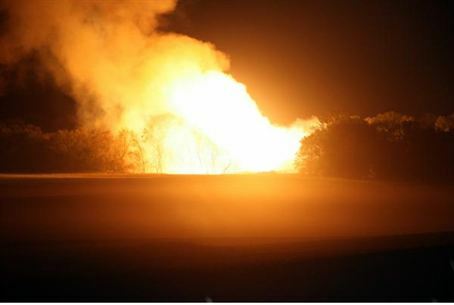 An Egyptian pipeline which provides gas to Israel and Jordan was once again hit by an explosion early Thursday morning. Egypt’s security services told AFP that the blast occurred 40 kilometers (25 miles) west of the town of el-Arish in the north of the Sinai Peninsula. Witnesses said they had seen armed men at the scene, the source said. He did not know if there had been any victims. This is the seventh attack on the gas pipeline since February, when former president Hosni Mubarak was toppled. The sixth attack took place in late September and left one person injured. Egyptian soldiers have prevented several other attacks on the pipeline. Previous attacks have disrupted gas deliveries to both Israel and Jordan several times, and according to some reports the pipeline has been closed again following the latest attack. Israel generates 40 percent of its electricity using natural gas, and Egypt provides 43 percent of its supplies of the material. Jordan uses Egyptian gas to generate 80 percent of its electricity. Electricity prices have risen in Israel as a result of the recurrent problems with the Egyptian gas supply. Israel hopes to be self-reliant for natural gas in three years, after its recently discovered massive off shore gas fields come on line.